Meet rodeo star Luke Brown next Saturday at Tahiti Village! Meet rodeo cowboy Luke Brown at Tahiti Village from 11 a.m. to 1 p.m. Saturday, Dec. 8th. He’ll be signing autographs, posing for pictures, handing out prizes, and performing a roping demonstration. Luke competes in team roping on the Wrangler National Finals Rodeo circuit, and will be in Las Vegas for the NFR’s annual December visit. Luke has nearly $2 million in Professional Rodeo Cowboy Association career earnings and place fourth in the 2017 world standings. So far in 2018 Luke and his partner Jake Long have won three titles: the World’s Oldest Rodeo in Prescott, Ariz., the Caldwell Night Rodeo in Idaho, and the Wyoming State Fair and Rodeo. Don’t miss this opportunity to meet Luke Brown at Manihi Isle, conveniently located between the pool and lazy river. We hope to see you here! 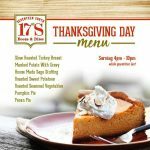 Enjoy a fulfilling (and a full feeling) Thanksgiving at 17˚ South Booze & Bites! 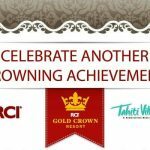 Tahiti Village earns another RCI Gold Crown Resort designation!